Infections within the root canal can cause pain and tooth loss. Once an infection occurs, the root canal must be treated to prevent the infection from spreading further. Though treatments are available to repair the damage caused by root canal infection, the best course of action is preventing infection from happening in the first place. Here are some helpful tips from Red Bank cosmetic dentist Michael Bixby, to help you prevent root canal infections. The root canal is the cavity within the center of the tooth that houses nerve and pulp tissue. A root canal infection occurs when the nerve and pulp tissue become infected, generally as a result of tooth decay or damage. Infected nerve and pulp tissue is very painful. If left untreated, infection of the root canal tissue may spread into the gums and form an abscess. Abscesses are painful, pockets of pus that develop around the ends of the tooth's roots. Root canal infections can also lead to swelling of the neck or face, bone loss around the tooth, tooth loss, and make the tooth vulnerable to further decay and breakage. In order to treat an infected root canal, the diseased pulp and nerve tissue must be removed. To prevent further damage, decayed portions of the tooth are removed, the tooth is cleaned, and then the tooth sealed. Dental fillings or dental crowns are often used to complete the repair process. For our patients in Red Bank, dental crowns are a great option to restore the strength and appearance of teeth damaged by root canal infections. Tooth decay is the main cause of root canal infections. Tooth decay is caused by a buildup of plaque and tartar. Plaque and tartar are made of food particles, saliva, bacteria, and acid from bacterial digestion. Foods and drinks high in acid and sugar are also responsible for tooth decay. Tooth decay destroys the protective layers of the teeth, enamel, and dentin. As these layers erode, bacteria are allowed to reach the tissues of the root canal. Practicing good oral hygiene, regular dental visits, and reducing your sugar and acidic food intake are essential to preventing tooth decay and root canal infection. 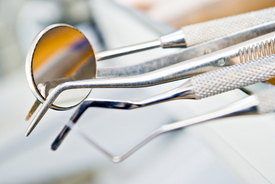 Tooth decay is not the only cause of root canal infections. Trauma, either from repeated dental procedures or a facial injury, can inflame and irritate the nerve and pulp tissues, leading to root canal infection. Injury may cause fractures or chips within the teeth. This can damage the protective enamel of the tooth, making it vulnerable to decay and root canal infection. Getting chips or fractures repaired immediately is a good way to prevent decay and root canal infection from occurring. See your dentist at the first sign of fracture or chipping. Avoid foods and drinks high in sugar and acid. Let us help you maintain a healthy smile! Contact Dr. Bixby today for your personal consultation.